Among wheel chair sports activities, tennis is one of the fastest growing and most challenging. To meet this increasing demand, the United States Tennis Association (USTA) offers a range of programs geared for wheel chair tennis enthusiasts across the country. In 1998, USTA took the reins from the National Foundation for Wheelchair Tennis for overseeing the sport. Since that time, the organization has become the first national governing body of both Olympic and Paralympic tennis overseeing the Paralympics, ParaPan American Games and World Team Cup event. Rules are the same as stand-up tennis, except the player is allowed two bounces of the ball. As a result, wheel chair tennis provides persons with physical challenges the opportunity to share in the sport with their peers and family, whether able-bodied or disabled. Proficient wheel chair users can play and actively compete against stand-up players. 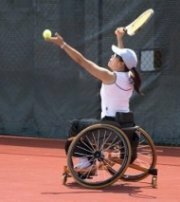 According to the USTA, a wheel chair tennis player must have a medically diagnosed, mobility-related disability with a substantial or total loss of function in one or more extremities. Playing wheel chair tennis adds to socialization and the normalization of life after sustaining a disabling injury. To play competitively, the individual must master the game of tennis and have the ability to proficiently maneuver his or her wheel chair. Learning the skills of the game on the tennis court is exciting and challenging. Regular play helps build strength and cardiovascular ability, as well as promotes overall wellness. For more information about wheel chair tennis, visit USTA's website at www.usta.com/Play-Tennis/Wheelchair-Tennis/Wheelchair/. The site lists tournaments, ranking information, resources, and special events. In addition, you can sign up for the organization's e-newsletter to stay up-to-date on the latest news and information about USTA wheel chair tennis.